Last night, while typing up a note about starting a Girl Scout troop, my wrist started hurting. The pain didn’t go away, so I rubbed my wrist with Bengay and wrapped it in hot towels. This must be some sort of repetitive strain injury, so today’s goals include finding a new desk, guiding the mouse with my left hand, and making an appointment with a sports medicine doctor. In accordance with my new ergonomically correct lifestyle and since I needed something to do while waiting for Office Depot to open, I baked some reduced fat brownies from Cooking Light magazine. Please click on the link to read the reviews and see the original recipe with nutritional information. For convenience, and in case the link gets changed, I’ve typed up the recipe with a few minor changes in technique. Preheat oven to 350°. Line a 9 inch square pan with Release foil or spray it lightly with cooking spray. In a 2 quart saucepan, bring water to a boil. As soon as water starts to boil, turn off heat and add espresso powder or instant coffee. Add chocolate chips, stirring until chocolate melts; cool slightly. Stir in butter and let cool for about 5-8 minutes. Stir in vanilla, egg, and egg white. Thoroughly stir together flour, granulated sugar, cocoa, baking powder and salt. Add chocolate mixture to flour mixture, stirring just until moist. Spoon batter into baking pan and bake at 350 for 21-25 minutes or until a wooden pick inserted in center comes out clean. Cool in pan on a wire rack. Sprinkle with powdered sugar, if desired. Lisa, the Ina Garten Outrageous brownies are incredible, They’re excellent – very fudgy. For an event, I’d make those. The Cooking Light brownies are good too. They’re sturdier and very chocolaty, but they’re not as rich. T, espresso powder is sold under the name Medaglio d’oro. It’s more powdery and has kind of a different flavor than regular coffee crystals….which are much more coarse. I used Folgers instant crystals because that’s all I had around the house. The brownies were excellent with instant coffee. Can you let me know what you find in terms of desks? I’ve been looking for an ergonomically correct desk, but it’s hard to find something that will accommodate my two huge monitors. Anna, I have an event coming up and I’ve promised to make brownies. I am considering making Ina’s Garten’s Outrageous Brownies. 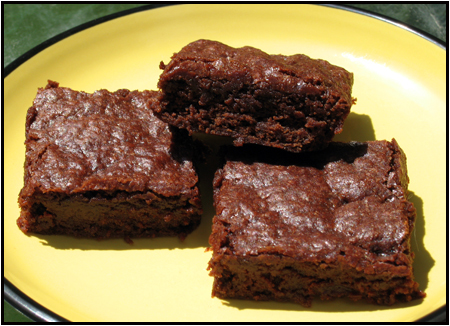 Have your made them, and do you think these reduced fat brownies can compare? The look great! Joe, I’ll take a look at your picture. Claire, you have to try these. They are great — as good as regular fat brownies….maybe better. These don’t even look like they’re lower fat…great! Oh I remember these – I made them back in June… I used Dutch-process cocoa powder and they were quite good! They were dense, had a nice chew and baked evenly.